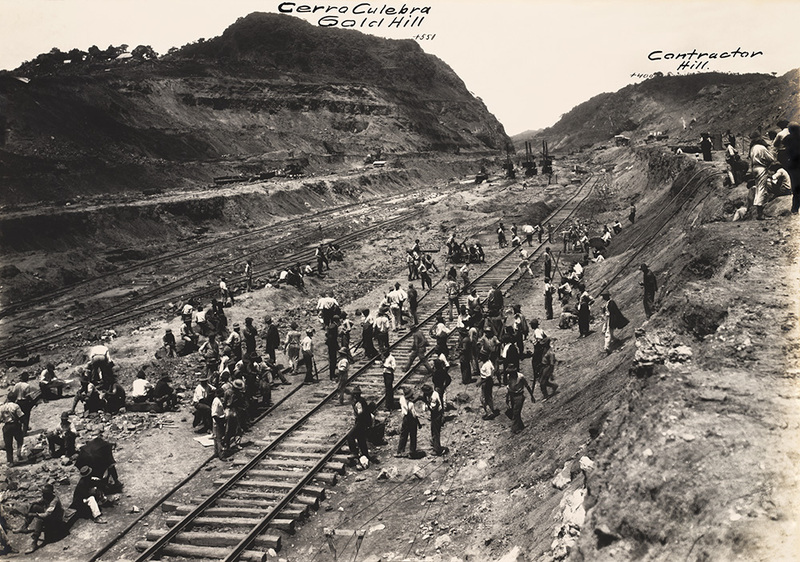 Workers in Culebra Cut enjoy a moment of peace while waiting for the mid-day labor train, June 1911. 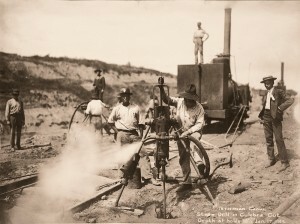 A salvaged French tri-pod steam drill in Culebra Cut, January 1905. When the Americans arrived at the Canal in 1904, they found that little useful infrastructure had survived from the French effort. The directive from President Roosevelt was to “make the dirt fly,” but that was at odds with reality. 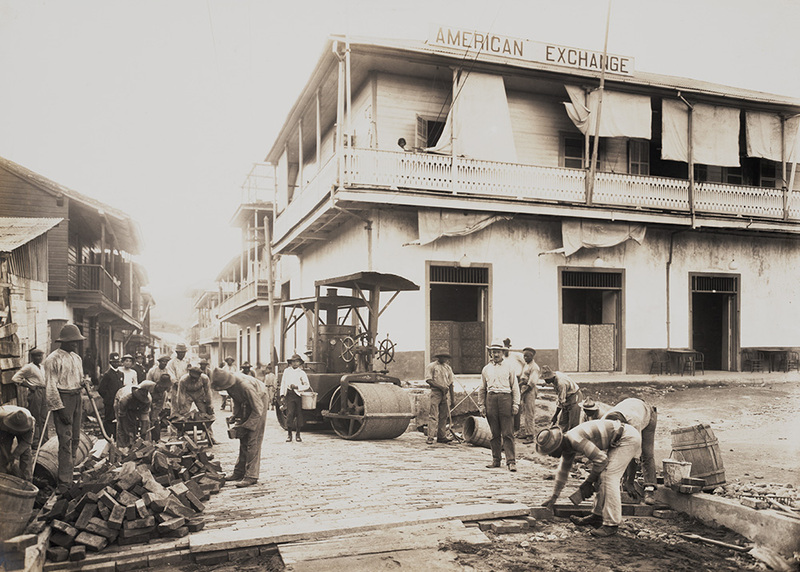 The city of Colón was filthy and disease ridden, buildings were in disrepair, most of the equipment lay in rusting heaps, and the Panama Railroad was in deplorable condition. Such a formidable undertaking would require a great deal of preparation. Chief Engineer John Findlay Wallace salvaged some of the French equipment and laid plans for improving the infrastructure. Unfortunately, Wallace was hampered by the combination of Roosevelt’s expectations for speed, Isthmian Canal Commission red tape, andthe loss of workers to the recurring outbreaks of yellow fever. In June 1905, after a little over a year on the job, Wallace resigned. John Stevens, who took over as Chief Engineer a month later, recognized the problems that had impeded Wallace. 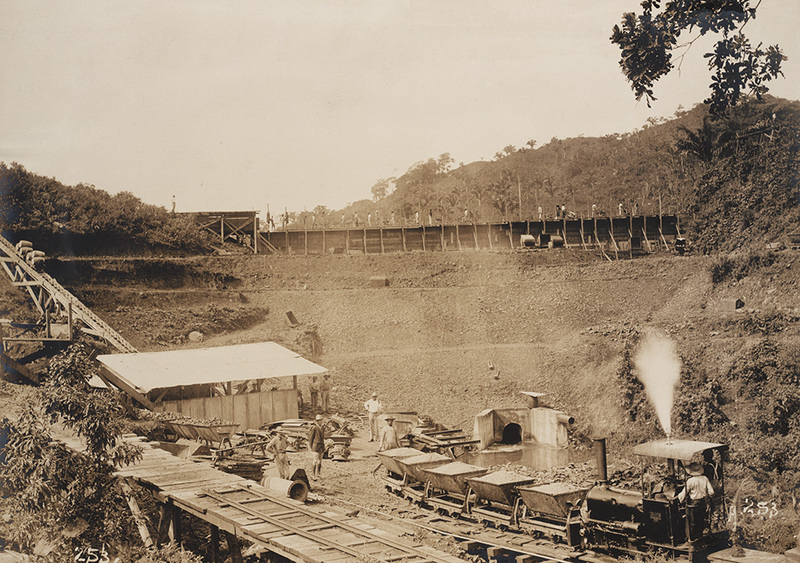 Stevens all but ceased excavation, tripled the labor force, and focused efforts on rebuilding the railroad, sanitation, equipment, streets, buildings, and improving the flow of materials and supplies to the Canal Zone. Stevens accomplished much in his brief tenure, but resigned in 1907 citing exhaustion. Having been frustrated by the slow progress of his first two Chief Engineers, President Roosevelt ordered Army Colonel George Goethals to take over and vested him with almost dictatorial decision-making power and, at last, the dirt began to fly. Steam shovel in Culebra Cut loading rock onto flat cars. Though the French had removed over 75,000,000 cubic yards of material from the Canal, 30,000,000 cubic yards of that excavation would be useful for the American construction effort. A further 238,845,587 cubic yards of material remained to be excavated before the Canal was finished. 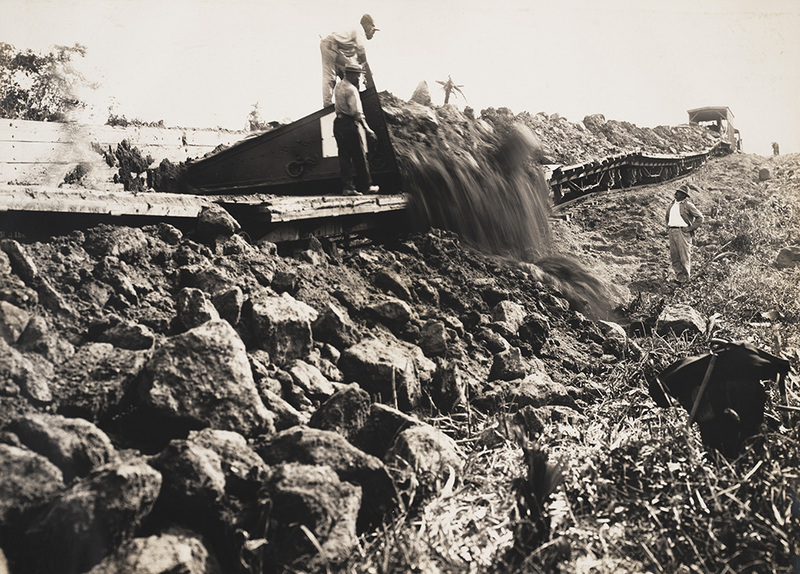 The Americans tackled the job using explosives, steam shovels, dredges, and backbreaking labor in intense heat. Culebra Cut, where the central spine of mountains forms the continental divide, was the most challenging and dangerous area to excavate. Lidgerwood unloader plow blade sweeps spoil from the flat cars. The Culebra Cut, the lowest point on the divide between Gold Hill and Contractors Hill, was 333.5 feet above sea level. In the 9-mile-long Cut, rock was blasted out. Steam shovels, loaded the material, or “spoil,” onto 160 trains a day hauling dump cars or flat cars equipped with Lidgerwood unloaders. 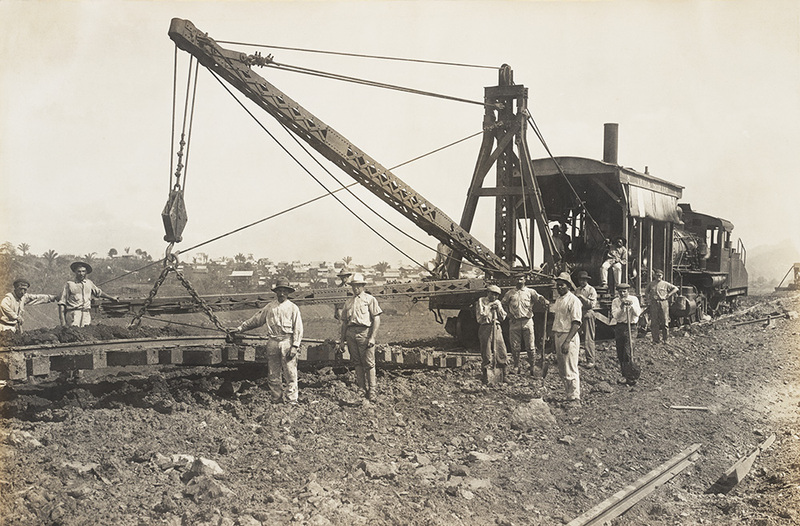 The unloader, a plow-like device, was pulled forward from the end of the cars by a cable powered by the locomotive. It could scrape the spoil off all 20 cars in 10 minutes. A dirt spreader car equipped with steel blades spread the material flat. Once an area was filled a track shifting machine picked up the rail tracks and moved them to a new area. Much of the spoil was used to reclaim 500 acres on the Pacific side to build the Balboa townsite, to create the Naos breakwater, and to build Gatun Dam. 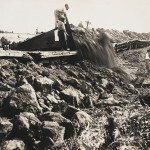 Millions more cubic yards were dumped in the jungle. A track shifter moves rails to a new dump location after an area reaches capacity. 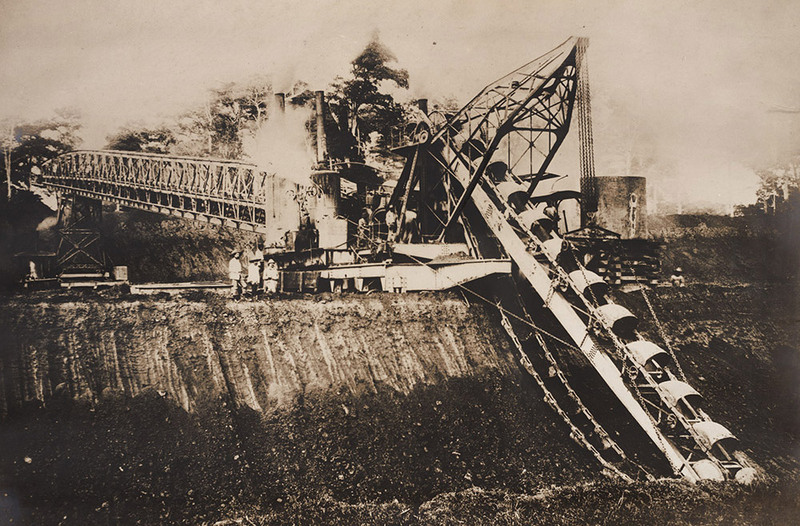 Le Brun excavator and “Bruette” bridge conveyor in use by the French at Tabernilla in the 1880s. 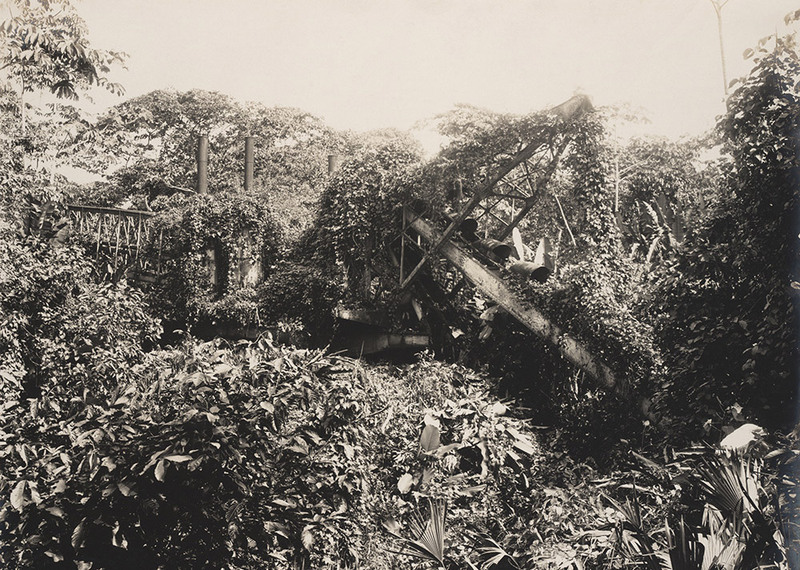 Le Brun excavator and conveyor at Tabernilla reclaimed by the jungle after the French departure. 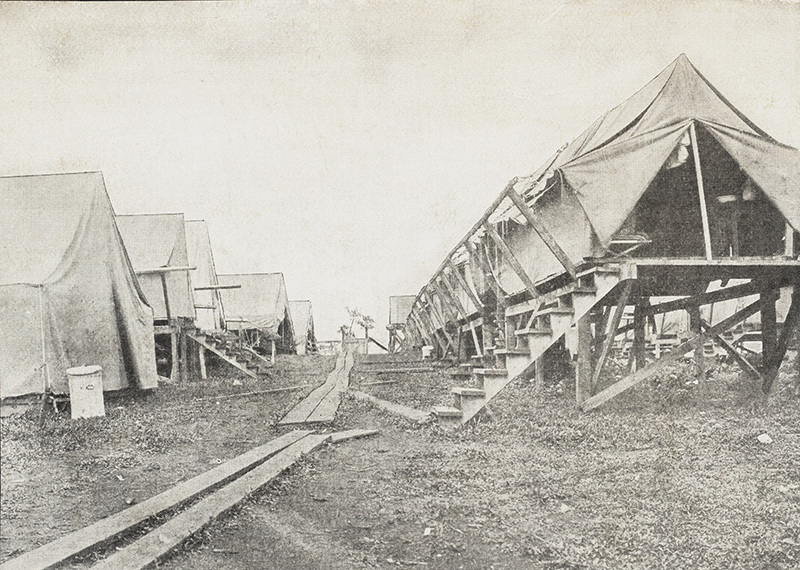 Workmen’s Camp at Gatun, 1906. A.B. 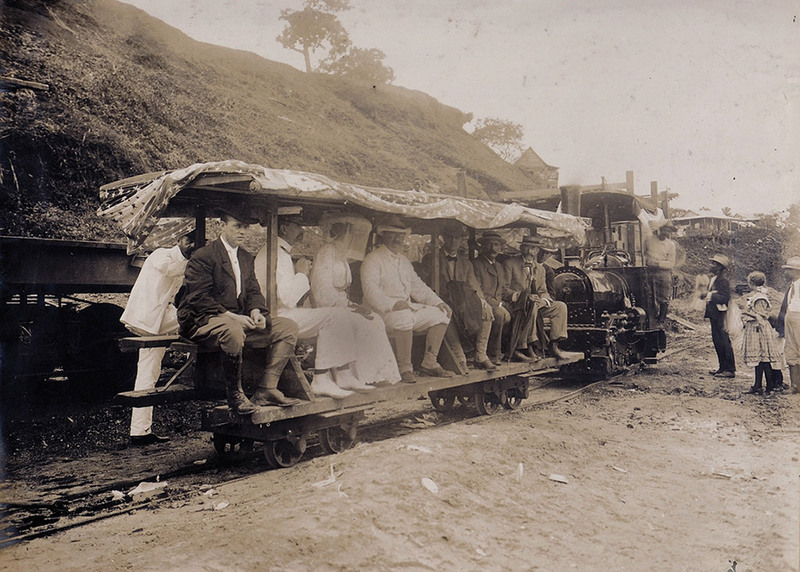 President Roosevelt and party tour Panama in an old French tramcar, November 1906. Water collecting in the muddy streets contributed to the growth of the mosquito population and the spread of yellow fever and malaria. 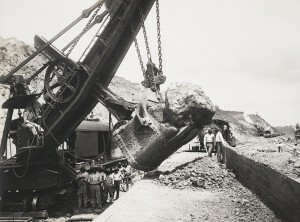 Deauville locomotive salvaged from abandoned French equipment in use at the Camacho Reservoir Dam, 1906.